HICEMFlex Latex Emulsion is used as an additive in mortar and concrete to provide superior bonding strength for tile repairs. It is particularly adaptable for redecoration (new tile application) over old concrete or old tile work. 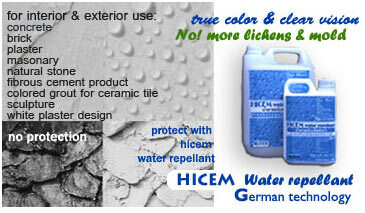 HICEM Water Repellant is solvent-free siloxane/alkylaloxysilane emulsion in water. It is suitable as a water-thinable prenating into absorant building materials and suitable for variety or substrate such as dense concrete and other large-pore surfaces especially lime & stone or silica-compose etc.